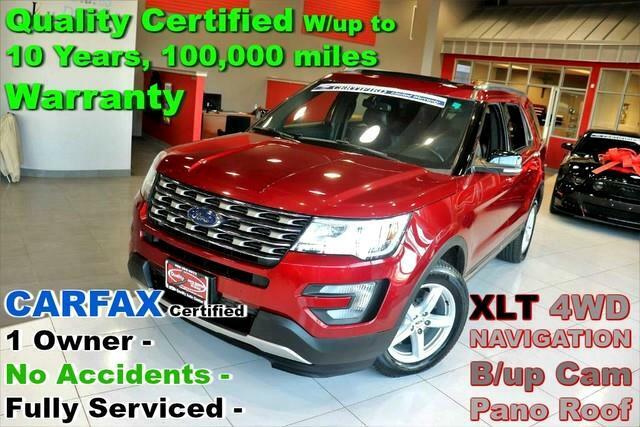 CARFAX Certified 1 Owner - No Accidents - Fully Serviced - Quality Certified W/up to 10 Years, 100,000 miles Warranty Quality Auto Center is excited to offer this 2016 Ford Explorer. This Ford includes: RADIO: PREMIUM AUDIO SYSTEM WiFi Hotspot CD Player AM/FM Stereo Satellite Radio Auxiliary Audio Input MP3 Player RUBY RED METALLIC TINTED CLEARCOAT EBONY BLACK, LEATHER-TRIMMED HEATED BUCKET SEATS Power Passenger Seat Power Driver Seat Heated Front Seat(s) Passenger Adjustable Lumbar Leather Seats Driver Adjustable Lumbar Bucket Seats EQUIPMENT GROUP 202A Multi-Zone A/C Keyless Start Remote Engine Start A/C Climate Control Auto-Dimming Rearview Mirror Rear Parking Aid ENGINE: 3.5L TI-VCT V6 V6 Cylinder Engine Gasoline Fuel DAYTIME RUNNING LAMPS (DRL) (NON-CONFIGURABLE) REQUIRES Daytime Running Lights TWIN PANEL MOONROOF Generic Sun/Moonroof Sun/Moonroof Dual Moonroof TRANSMISSION: 6-SPEED SELECTSHIFT AUTOMATIC Transmission w/Dual Shift Mode A/T 6-Speed A/T VOICE ACTIVATED NAVIGATION SYSTEM Navigation System CD Player Premium Sound System Auxiliary Audio Input MP3 Player *Note - For third party subscriptions or services, please contact the dealer for more information. * CARFAX shows that this is a one-owner vehicle -- no wonder it's in such great condition. In their original incarnation, SUVs were chiefly owned by folks who valued utility above sport. Not anymore! The Ford Explorer XLT redefines the SUV and makes the perfect all around family companion. Equipped with 4WD, this Ford Explorer gives you added confidence to tackle the surface of any path you take. Marked by excellent quality and features with unmistakable refined leather interior that added value and class to the Ford Explorer With an efficient and easy to use navigation system, this Ford Explorer will help get you from Point A to Point B in no time flat. Previous service records are included, making this Ford Explorer extra special. High performance is what this vehicle is all about. You will be reminded of that every time you drive it. This Ford Explorer XLT comes standard with features that are essential in the 21st Century. However, Ford decided to take it one step further and add a handful of quintessential options that will undoubtedly add to this vehicle's quality and value. How's the paint you might ask? It's flawless. One of the best finishes we've ever seen. A perfect find to complement any rare automotive collection. This beautiful lass will turn heads everywhere she goes. Amazing wheels help set this Ford Explorer apart from other vehicles like it. More information about the 2016 Ford Explorer: The Ford Explorer has been rated one of the safest utility vehicles at any size or price it's the first vehicle in the world to offer rear inflatable seatbelts. Curve control -- a more advanced version of electronic stability control -- is also a Ford exclusive. Ford's MyKey system helps parents manage the teen drivers in the family. The Explorer also stands out for being one of the greenest choices available. Ford claims best-in-class gas mileage for non-hybrids and notes that the Explorer EcoBoost will go 20 percent farther on a gallon of gas than the Honda Pilot. This model sets itself apart with excellent ride quality, Quiet interior, world-class safety features, EcoBoost engine provides good mileage, and good value No Credit / Bad Credit / No Paystubs, No problem !! ! All Approved ! Everyone drives ! CLEAN, GORGEOUS, LOW MILES, SHOWROOM CONDITION. CALL NOW QUALITY CERTIFIED up to 10 YEARS 100,000 MILE WARRANTY , To Certify a vehicle, there will be an additional cost for Certification. CALL NOW For details. STUNNING AGGRESSIVE LOOK ON THIS BEAUTIFUL--Call today to schedule a test drive... Good Credit/Bad Credit/No problem!!!! Get paid cash? No problem!! 100% Credit Approval with interest rates starting at 2.49% for qualified customers, our rates will not be beaten. We price our cars at wholesale price to guarantee the best deals for our customers. Our inventory moves quick, please call to confirm the availability of the vehicle of your interest Springfield location 973-564-0112. This vehicle is located at our SPRINGFIELD location. Come visit our new showroom in Springfield NJ. This outstanding example of a 2016 Ford Explorer XLT is offered by Quality Auto Center. This SUV gives you versatility, style and comfort all in one vehicle. This 4WD-equipped vehicle will handle majestically on any terrain and in any weather condition your may find yourself in. The benefits of driving an Four Wheel Drive vehicle, such as this FordExplorer XLT, include superior acceleration, improved steering, and increased traction and stability. A truly breathtaking example of pure vehicle design achievement...this is the vehicle of your dreams! More information about the 2016 Ford Explorer: The Ford Explorer has been rated one of the safest utility vehicles at any size or price it's the first vehicle in the world to offer rear inflatable seatbelts. Curve control -- a more advanced version of electronic stability control -- is also a Ford exclusive. Ford's MyKey system helps parents manage the teen drivers in the family. The Explorer also stands out for being one of the greenest choices available. Ford claims best-in-class gas mileage for non-hybrids and notes that the Explorer EcoBoost will go 20 percent farther on a gallon of gas than the Honda Pilot. This model sets itself apart with excellent ride quality, Quiet interior, world-class safety features, EcoBoost engine provides good mileage, and good value No Credit / Bad Credit / No Paystubs, No problem !! ! All Approved ! Everyone drives ! CLEAN, GORGEOUS, LOW MILES, SHOWROOM CONDITION. CALL NOW QUALITY CERTIFIED up to 10 YEARS 100,000 MILE WARRANTY , To Certify a vehicle, there will be an additional cost for Certification. CALL NOW For details. STUNNING AGGRESSIVE LOOK ON THIS BEAUTIFUL--Call today to schedule a test drive... Good Credit/Bad Credit/No problem!!!! Get paid cash? No problem!! 100% Credit Approval with interest rates starting at 2.49% for qualified customers, our rates will not be beaten. We price our cars at wholesale price to guarantee the best deals for our customers. Our inventory moves quick, please call to confirm the availability of the vehicle of your interest Springfield location 973-564-0112. This vehicle is located at our SPRINGFIELD location. Come visit our new showroom in Springfield NJ.